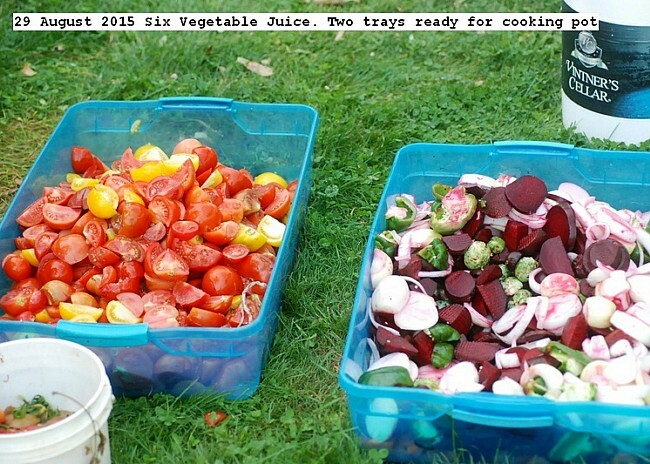 It is getting to the end of the vegetable garden season, so the vegetables left were picked and converted into juice. Vegetable available were onions, tomatoes, beets, carrots, green peppers, and Brussels sprouts. The vegetables were washed, cut into smaller pieces, placed in cooking pot with ten liters of water added per batch.The material was cooked until soft about 20 minutes then blended into a slurry.The slurry was screened in a Victorio strainer. The residue was put through a Champion Juicer to extract maximum nutrients. The juice was placed into liter jars and pressure canned at 15 PSI for 15 minutes.A total of 40 liters were obtained. Pictures depict the process. This entry was posted in Uncategorized and tagged 29 August 2015 Six Vegetable Juice, Six Vegetable Juice, Vegetable Juice. Bookmark the permalink.